Moisture movement is related to curing of concrete, we know there have different curing options and different option produce different maturity of concrete and produce different properties of concrete. When concrete previously dried in air under particular relative humidity is placed under water or subjected to relatively higher humidity, it will suffer swelling. We know swelling may be from different causes; here our concern is moisture movement. But the drying shrinkage occurs in initial stage of drying is not recovered completely, even when concrete is stored in water for long period. The range of this irreversible portion of shrinkage is often lies in between 0.3~0.6 of dry shrinkage (lower value is very common). The irreversible behavior of concrete is due to additional bonds formation within gel during drying and closer contact of gel particles is developed. Cement paste is less affected due to closer gel configuration under drying, when it is allowed to undergo sufficient hydration before drying. Neat cement paste shows no/significant residual shrinkage under wetting, when it is cured under water for six month before drying. Sometimes while drying carbonation may occur simultaneously; in this case cement paste is found insensitive to such moisture movement to increase residual shrinkage. So a simple relationship between shrinkage and degree of moisture movement cannot be established. Magnitude of moisture movement of concrete varies with humidity and concrete composition. A lightweight concrete subjected to greater moisture movement than that of ordinary concrete. Again under successive drying and rewetting cycles, moisture movement reduces gradually as additional bonds are formed within gel. 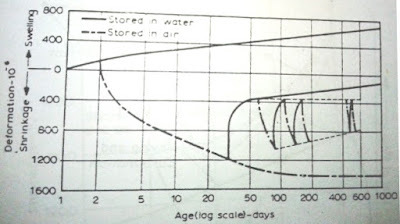 When concrete is stored in water for sufficient period, the continuous hydration results additional swelling to some extent and the net dimension of specimen or member is increased followed by reversible movement under dry-swelling cycles. Typical magnitude of moisture movement of neat cement, mortar & concrete are shown in above table.Moisture movement is represented here as linear strain. 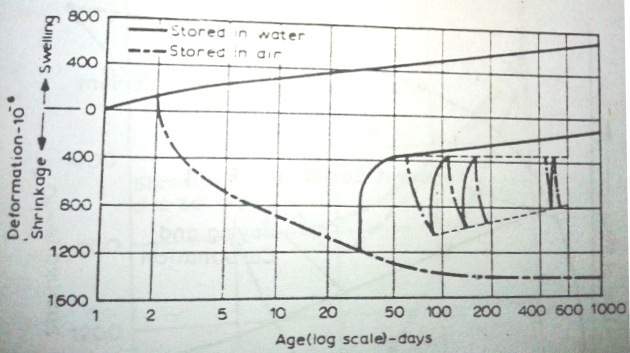 Above figure shows relation between linear strain and curing period under alternative storage in water and in air (relative humidity=500C).